Bhima's pastimes with King Kubera and his fights with the Himalayan Rakshasas are but two of the events that tie him to Nepal in the Mahabharata Period. In fact, Bhima is very famous personality in Nepal, deified by so many Nepalis that they are known collectively as the 'Cult of Bhimasena'. The history of Bhimasena's abiding presence in Nepal is described here, in an adaptation of a paper on Ancient Nepal by Jagadish Chandra Regmi (1980-81). Hinduism in Nepal incorporates numerous cults, including that of Bhimasena. Newar traders particularly worship him as their patron deity who is said to help them get riches through trade. Hence, one can see pictures or images of Bhimasena take place at every shore in the Kathmandu valley. There are also numerous shrines and well built temples within and without the Kathmandu valley where the Newars have settlements. It is important to note here that this cult of Bhimasena is unknown in India, though some say that Bhimasena is worshipped by some aboriginal tribes in parts of central India. The antiquity of the Bhimasena cult may be related to hero worship, because he is one of the famous heroes of the Mahabharata epic, where he is also described as the son of Vayu, the wind god, enjoying extraordinary qualities of heroism. But in Nepalese tradition he is not actually worshipped in that capacity. In the traditional history (genealogy) of Nepal, Bhimasena finds his first mention as a resident deity of Dolakha, where the valley was in the form of a lake. This legend suggests that the Bhimasena cult has its origin in Dolakha. We find another reference to Bhimasena in the genealogical work during Shivadeva Varma's rule . The genealogy states  that King Shivadeva brought Kameshwara Bhimasena from the west and established him to the west of Pashupati temple. This refers to a shrine at Deopatan which contains two stone images of Bhimasena. 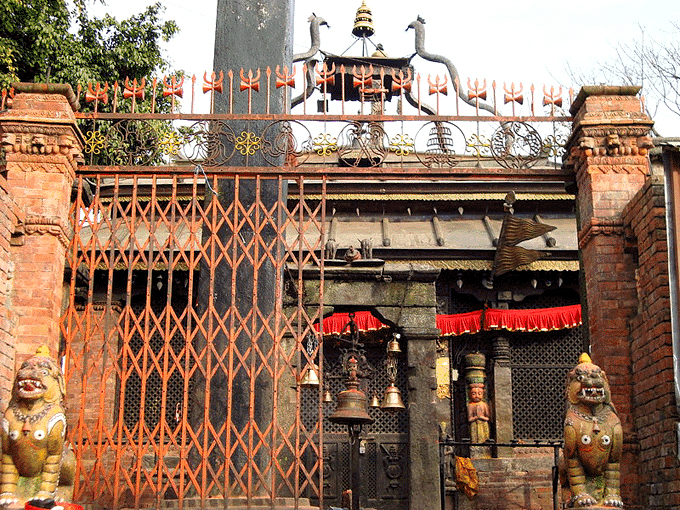 The Patan Temple of Bhimasena is recorded in the genealogy  as having the antiquity of the Kathmandu. King Shrinivasa Malla had built a temple here in A.D. 1681 which is recorded in an inscription . The shrine of Bhimasena at Dolakha now presents only late inscriptions to prove its antiquity, although traditional legend claims much antiquity (as we have stated elsewhere) for it. The shrine itself presents us its composite religious characters as the devotees worship in the shrine three deities: Shiva, Kali and Bhimasena. Inscriptions lying around the temple and dated A.D. 1520 and succeeding years address the shrine as Shiva . One inscription dated A.D. 1524 mentions 'Bhima-ganeshvara'  and another inscription dated A.D. 1549 mentions the name as ' Bhimeshvara' . A critical analysis of other inscriptions and other records found there may exhibit the gradual evolution of the composite character of the said shrine. Tantrik texts also retain chapters on the Bhimasena cult as evidenced by the famous text of Rudrayamala Tantra . An intensive study of religious literature and other appropriate sources may also prove the cult's importance. Unfortunately, the Bhimasena temple at Dolakha was damaged in the great quake of 2015. 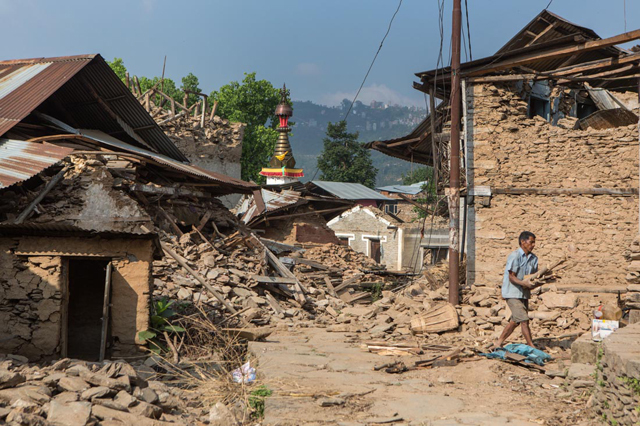 The entire Dolakha district was one of the hardest hit areas. The first quake hit on April 25th. On May 12th, a second quake hit, causing further damage in Dolakha. 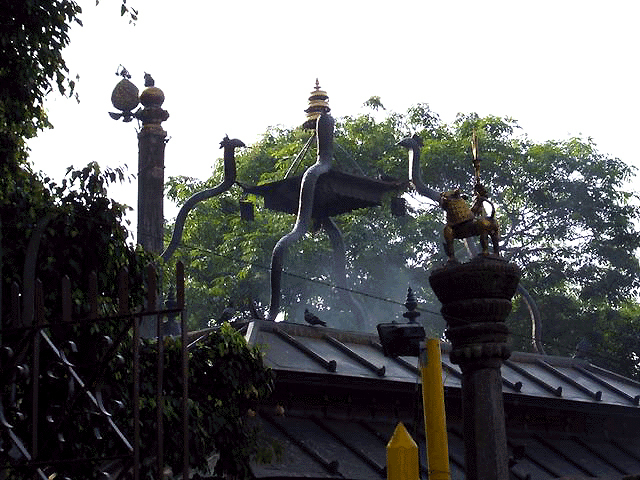 Bhimasena temple was one of the few that survived. King Shivadeva of inscriptions? whose dates are known to the c. A.D. 590-604 A.D.
 History of Nepal, Ed. D. Wright, p. 82. Abhilekh Sangraha, Pt. III., p. 15; In a copper plate dated A.D. 1564 (D.R. Regmi, Medieval Nepal, II., p. 43; Ibid IV., pp. 20-21) mention is made of Bhimasena Temple. This reference may prove earlier existence of this temple though the reference is not much clear. D.R. Regmi, Medieval Nepal, Pt. IV., pp. 185 ff. D.V. Bajracharya - T.B. Shrestha, Dolakhako Aitihasik Ruparekha, p. 85 ff. I have in my possession a manuscript of Bhimasena Sahashranam (1000 Names of Bhimasena) which is stated to have been contained in the said Tantrik text.